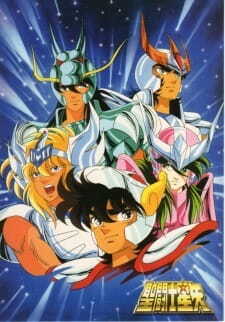 A summary of the 114 episodes of the TV series Saint Seiya. This page's synopsis says it all: this is a summary of the series (except for the Asgard/filler saga), that will inform all the newcomers what the hell happened before the (for that time) recently released Hades saga. There's no new animation nor music: everything is recycled from the classic series (except for the narrator voice, obviously). This OVA (tries to) inform (at the speed of light) the facts of the series, at the same time it shows a few battle scenes. Come on, there's no way you can sum a 100 episodes series in 24 damn minutes! One of the stuff that bother me the most about this OVA is that the narrator imply that Seiya did all the work, and the other saints only assisted him. That's a lot of crap. Come on, a lot of people hate Seiya already (not me, I like his determinator/hot blooded personality), this will only piss off the people who already doesn't like him! I just can recommend this to someone who's dying to watch the Hades saga, and don't want to see the original series. But who want to see the third saga of a series, without watching the first two? Don't watch this. Give the original series a chance. If you like it, great, if you don't, then you probably will not like the Hades saga! La sinopsis lo dice todo: esto es un resumen de la serie (dejando de lado la saga de Asgard, que es filler), para preparar a la gente a la (por ese entonces) nueva saga de Hades. Nada de animación o música nueva, todo es rehusado de la serie clásica (excepto la vos del narrador que nos informa que pasa). La OVA informa de los hechos, al tiempo que muestra alguna que otra escena de alguna pelea. Vamos, no hay forma de hacer un resumen eficiente de 100 capítulos en solo 24 minutos. Una de las cosas que me molesta de este resumen es que el narrador insinúa que Seiya hizo todo, y sus compañeros solo lo asistieron. Señores, ya mucha gente odia a Seiya (yo no, es uno de mis favoritos), esto solo irrita más a las personas que no lo quieren!. Solo puedo recomendar esto a alguien que está desesperado por ver la saga de Hades, pero que no quiere comerse la serie original. ¿Pero quién querría ver la tercera saga de una serie, salteándose las dos primeras? No vean esto, gente, vean la serie original. Vale la pena.